Basic Qualifications in Environmental Law/ Waste and Water Economy/ Emission Protection/ Soil-, and Nature Protection/ Sustainable Energy Economy, Regenerative Energy/ Energy Efficiency/ Geographical Information Systems (GIS) for Environmental Protection/ Databank Systems & comparative applications for Global Waste Economy. Nov 2011 Verein Berliner Künstler, Berlin & Listros e.V. Nov 2011 Afrikahaus, Berlin & NARUD e.V. In Cooperation with Commissioner for Integration – Berlin-Schöneberg & GLADT e.V. since 09 Berlin Founding Board-Member: African Union African Diaspora Sixth Region e.V. I mastered in 2002 in economical engineering (Dipl. Wirt.-Ing.) at the University of Applied Sciences in Cologne with a thesis for the consulting company IDS Scheer AG in Saarbrücken. The topic of my thesis was “Economical Advantages of Enterprise Portals with Regard to Knowledge-Management Aspects”. Already as student intern for Victoria AG / ITERGO Information Technology in Düsseldorf I applied my interest in knowledge management while controlling the hard- and software rollout via databank. In an internship at ABB AG Mannheim I was exposed to the practical aspects of quality management. In November 2004 I was granted the certificate „Controlling and Project Management with SAP R/3“. In 2002 I started project management and consulting for the Multi-Media Agency cyberNomads in Berlin and in 2003 became partner in the agency. With the expertise of my thesis I was able to support the concept for the digital architecture of an educational online databank. The portal went online in 2002 in cooperation with the Office for Civic Education of the German Government (BPB). Equipped with a five year master plan and with financing of the BPB we realized three major Media Conferences with international speakers from academia, media and art. We instructed freelancers and interns and successfully we pitched our concepts to institutions. Goethe Institute Berlin 2002, Heinrich Boell Foundation 2003, and House of the Cultures of the World HKW 2004 hosted our events at their locations as cooperation partners. We researched high-quality content and experts and initiated a global offline forum for media partners from print to TV for up to 400 participants. Our online-lobby of 4.000 registered contacts reaches out to the German mainstream, Europe and the African Diaspora. We organized a press conference with Thomas Krüger, the head of the BPB and (AFROTAK TV) cyberNomads. Under umbrella ship of the German UNESCO we realized the “International Literature Award” in honour of the late May Ayim as acclaimed German Project for the Memory of the Slave Trade and its Abolition. (AFROTAK TV) cyberNomads developed the concept and realized the multimedia event. I introduced the international winners who we flew in. My moderation for the 3 hour gala-show applied the languages German, English and Yoruba. The accompanying book documents offline the competition entries. For another major publication “The Black Book,” we researched 30 black mainly black experts to rewrite German history in the fields of art, academia, media, politics and business. We have taught basic CMS-knowledge in workshops and have given a guest lecture on “Migration, Cyberspace and the Workforce” to the University of Applied Sciences, Fulda on excursion to Berlin. The African Cup Soccer Gala I moderated 2006. Since 2007 the South African Embassy consults cyberNomads for expertise on media-strategy. The SA Embassy invited me as representative for the African Union Conference RCC (Diaspora in Europe Regional Consultative Conference) in September in Paris. Based on my work as teamplayer and Interface inbetween BpB and institutions from education, media, culture and migrants I have recieved an award for best practice from the government foundation „Demokratie und Toleranz“ for the work of cyberNomads in 2007. The award ceremony took place in spring 2008. 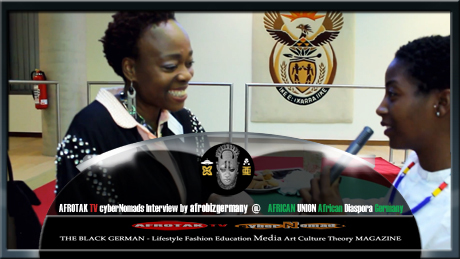 AFROTAK TV cyberNomads have been nominated for the Peace Award Bremen 2005 and recieved the Adler Award from the African Youth Foundation in Bonn as Best Media in 2006. 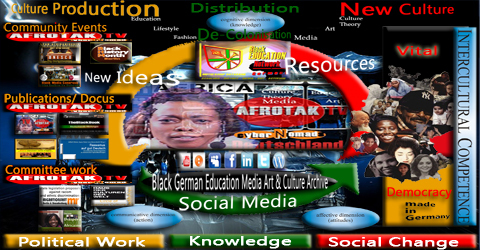 From 2002 to 2007 more than 8 Millionen visitors have used the educational online portal and more than 4000 contacts from education, science, business, art and media have registered in the Black German Yellow Pages that we established to create an overview and directory for the Black Diaspora Germany as part of the portal. Since 2002 I implemented a number of media concepts and promotion campaigns, created an online portal initiating a two year monthly flow of 300.000 visits for almost 3 years. The portal is presently as Afrotak TV cyberNomads available.